Two years before Nine to Five opened, I was a medical insurance claims approver for the Metropolitan Life Insurance Company. About 370 of the roughly 400 office workers were women; of the 30 men, half were in management or decision-making positions. During my fourth week on the job, a co-worker looked furtively over her shoulder and whispered, “Vince! Sign this!” while tossing me a union authorization card. Having witnessed the gains made by clericals in Boston, San Francisco, and Cleveland when they united around their demands, I want to encourage you in your efforts and express my heartfelt support. Much hugging and dancing ensued, and we put a copy on every worker’s desk. [our organization], 9to5, had already been active and Jane was intrigued by it, and so she came to me and said she wanted to make a contribution to our work in the best way she knew how, and that was to make a major motion picture. The movie was Fonda’s idea, and she produced it through her own film company, IPC Films (the acronym for the early seventies’ anti-war group, Indochina Peace Campaign). But she had already been contributing to working women’s causes by making several presentations before mass audiences of mostly women office workers in 1979, urging them to organize as part of her then husband Tom Hayden’s national Campaign for Economic Democracy. Nussbaum arranged for Fonda, script writer Patricia Reskin and director Colin Higgins to meet several times with forty women office workers to learn first-hand about the problems they faced on the job, plus the fantasies they harbored for getting even with the boss. The workers’ stories inform most of the film’s office situations and dream sequences. Fonda abandoned thoughts of making a serious film when she got the idea to cast Lilly Tomlin (as Violet) and Dolly Parton (as Doralee), and so made it funny. 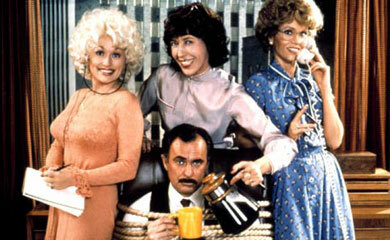 Fonda claims she gave the best parts to Tomlin and Parton. But Fonda’s character, Judy, who has no paid-work history and who we watch begin her first nervous days at “Consolidated Companies,” represents the great surge of women who entered the paid labor force in the mid-seventies, many for the first time. Hopes were high for the personal and social benefits this rise of women at work would offer: women’s independence; a larger pool of creativity and productivity in the economy; a democratic division of domestic labor, and more. What many working women like Judy found, however, were indignities in workplaces like the film’s Consolidated Companies managed by chauvinist men like Franklin Hart, the character played by Dabney Coleman. And they found employers like mine that offered low-paid and mainly dead-end jobs, that moved our seats if we talked too much, that timed our bathroom and coffee breaks, and made us endure humiliating monthly talks with our super-visor concerning the all-important daily production sheet we were required to submit each night: if our output met the norm, they told us to do more; if we didn’t make the norm we were demeaned to the point that some workers were brought to tears. Like us clericals at Metropolitan, the new job entrants found that advancement in the office was limited to a small number of positions usually not worth the small increase in pay, and that top management was dominated by men. Our chief manager showed favoritism toward some of the younger women, and even if some did not believe he was the office philanderer, his grin showed he took pleasure in keeping that rumor alive. These common conditions constitute a 180-degree turn from the respect and good pay that marked the work of office clerks when these jobs were dominated by men up until the early 1900s. Nussbaum strongly believes that the film’s important contribution to the predicament of the growing number of working women was its successful ridicule of bosses like Franklin Hart, referred to as a “sexist, egotistical, lying, hypocritical bigot.” She thought its humor so excels at mocking the irrationalities of workplace sexists and sexism that it moves us beyond the question, is there sexism at work? to, what can we DO about it? Violet, Judy and Doralee, of course, DID do something about it, and their actions clearly embodied 9to5’s “Office Workers’ Bill of Rights.” But, perhaps the most important of the film’s contributions is that the three women’s actions — funny, zany and serious — raise a very provocative and subversive question for ALL workers: do we really need bosses? This entry was posted in English Language on September 9, 2014 by Vincent Serravallo. Prof. Vincent Serravallo teaches the sociology of work at Rochester Institute of Technology, collaborates on programming the Rochester Labor Film Series, and serves on the board of the Pettengill Labor Education Fund.